Ben Barker (right) in action at Alwalton four years ago riding for Birmingham. New signing Ben Barker insists he snubbed more lucrative offers to join Panthers’ Premier League title challenge. The Cornish charger was snapped up in a shock midweek move that saw the axe fall on teenage ace Robert Lambert. And Barker, back to full fitness after breaking his back in five places in a horror smash in the British Final in June, can’t wait to pull on a Panthers race-jacket for the first time when they entertain Newcastle Diamonds at the East of England Showground tomorrow night (Friday, 7.30pm). He said: “I had some other offers and I could have gone elsewhere for more money, but I like the people at Peterborough. It was an easy decision as soon as they expressed an interest and I’m in it for the long haul. “I want to help them get a play-off spot and have a go at winning the league. “No rider likes being out and it just makes you more determined to do well when you return. “I can’t wait to get going and start scoring points and entertaining the fans. “This is the worst injury I’ve ever had, but the recovery has gone really well and that is down to the fantastic treatment I’ve received and the great family I’m lucky enough to have around me. “Some people might think it is a gamble to bring me in after being out for a while, but I don’t see it like that. “I think I’m on a bargain average considering I have been up close to 10 in this league before injuries held me up. Barker will slot into second spot in the club’s averages which means a return to the number one spot for currently injured captain Ulrich Ostergaard. 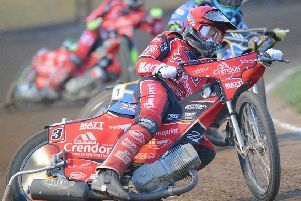 Danish ace Nicklas Porsing – who guested to great effect in a victory over Sheffield last month – has been drafted in to cover for broken hand victim Ostergaard tomorrow. Panthers bosses meanwhile have refused to go into detail over their reasons for sacking Lambert, who burst onto the international stage when representing Great Britain in the Speedway Best Pairs and World Cup earlier this year. Lambert has ridden in only half of Panthers’ meetings this season (14 out of 28) due to injuries, illness and fixture clashes.